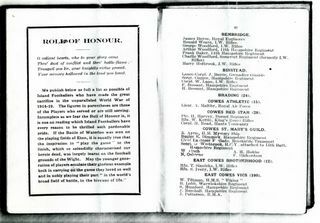 The Isle of Wight Memorial Cup was presented to the Isle of Wight Football Association by the 1st Bn Royal Irish Rifles in 1919/20, in memory of those who died in the Great War, and in appreciation of the welcome that the Battallion had received in IW Football circles. 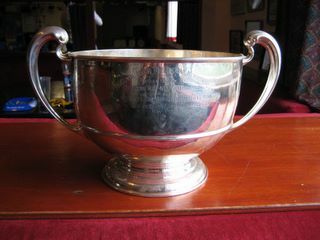 It takes the form of a large silver cup, played for annually by local teams, with any proceeds raised going to the then Hampshire Benevolent Fund. The IW Memorial Cup competition is still played today; it is awarded annually to the winning team and held by them for the year. Information taken from Isle of Wight Football Association Handbook (1919-20) courtesy of Mike Bull, and the IW FA Golden Jubilee (1898-1948) Handbook, courtesy of Mr Charles Taylor. Thanks also to Andrew Justice of the IW FA and Roger Taylor of Shanklin F.C. for permission to photograph the Cup. 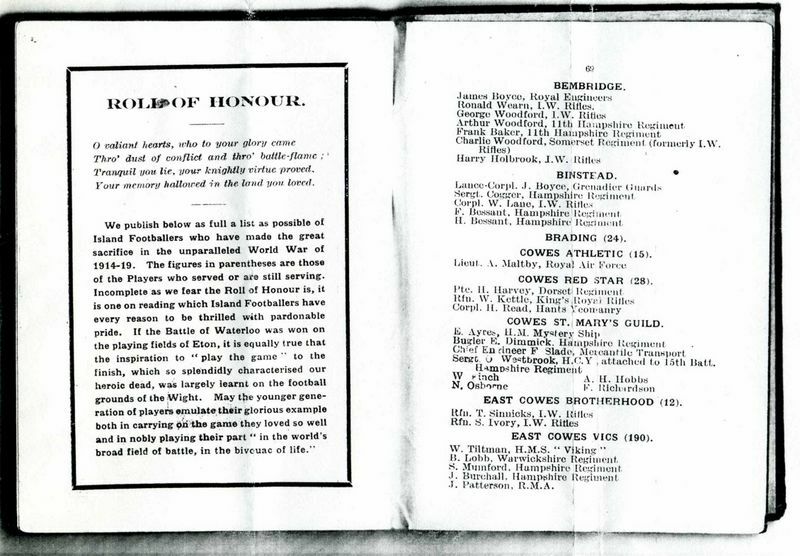 The 1919-20 Handbook of the Isle of Wight Football Association contained a Roll of Honour listing many Island footballers who died during the First World War. 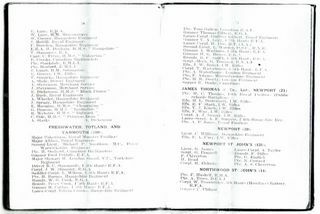 We publish below as full a list as possible of the Island Footballers who have made the great sacrifice in the unparalleled World War of 1914-19. The figures in parentheses are those of the Players who served or are still serving. Incomplete as we fear the Roll of Honour is, it is one on reading which Island Footballers have every reason to be thrilled with pardonable pride. If the Battle of Waterloo was won on the playing fields of Eton, it is equally true that the inspiration to "play the game" to the finish, which so splendidly characterised our heroic dead, was largely learnt on the football grounds of the Wight. May the younger generation of players emulate their glorious example both in carrying on the game they loved so well and in nobly playing their part "in the world's broad field of battle, in the bivouac of life." E.R.A. H. Denham, H.M.S. "Hampshire"
Capt. C. Fryer, H.M.S. "Bulgarian"
E. Dickenson, H.M.S. "Black Prince"
C. Cole, H.M.S. "Princess Irene"
Driver B.C. 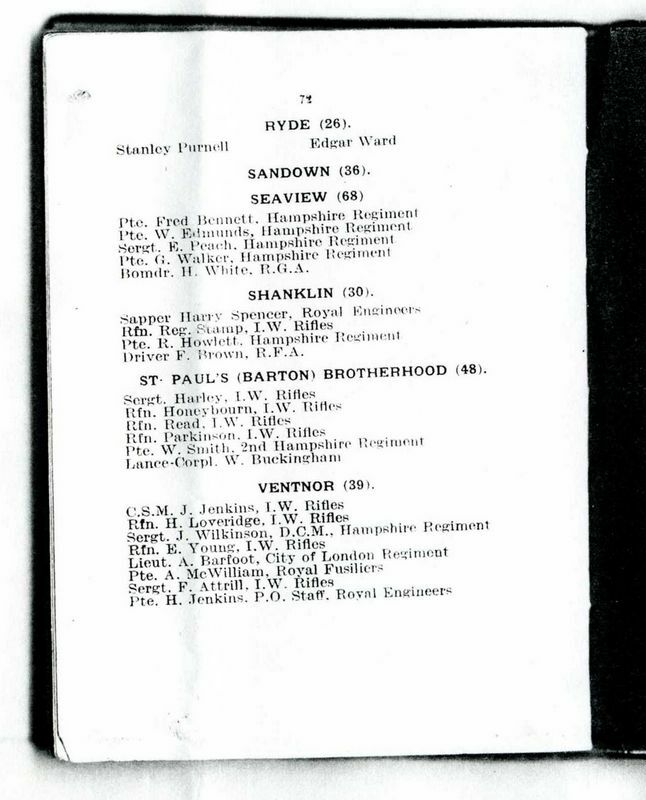 Simmonds, 1/5th Hants R.F.A. Saddler-Corpl. 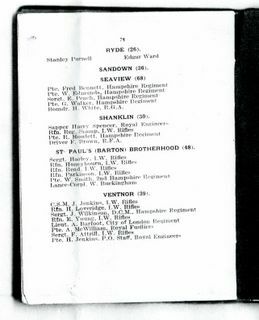 L. Wilson, 1/5th Hants R.F.A. Bombdr. Percy Cook, 1/5th Hants R.F.A. Pte. Tom Gallop, Canadian R.A.F. Gunner V.A. Legg, 1/5th Hants R.F.A. Second-Lieut. L. Warder, D.S.C., R.N.R. Gunner A. Wadham, 1/5th Hants R.F.A. Bombdr. R.C. Smith, 1/5th Hants R.F.A. Corpl. T. Waterhouse, 1/5th Hants R.F.A. Lance-Sergt. A.F. Burgess, 2/4th Hampshire Reg. Corpl. W. Trowbridge, 5th Hants (Howitzer) Battery, R.F.A. Sir, - I thought the following names of players of the Ventnor Football Club who are at present serving their country might be of interest to the followers of the game in Ventnor and those who follow the fortunes of the Club in other parts. At the front G. Morris. P. Windebank now home wounded in the Hants Regt., F. Thorogood, Royal Field Artillery, and an old favourite Sept. White, also of R.F.A., while A. McWilliam, the Fusilier centre-forward, who assisted Ventnor in the last few games of last season and proved a fearless player and a dead shot at goal, was shot through the head and died of his wounds early in the war. Those in Kitchener's Army are F. Yelf, W. Taylor, T. Burchett, J. Wilkins and H. Wright. In the 8th Hants R.F.A. in India are H. Cullen, W. Taylor, A. Dyer, O. Channing, W. Cass and W. Bates; others are W. Spencer, R.A.M.C., H. Loveridge, National Reserves at Aldershot, and R. Colenutt in the North Sea. I.W. Rifles - J. Jenkins, T. Pearson, A. Young, H. Young, N. Young, L. Channing and H. Dennis. 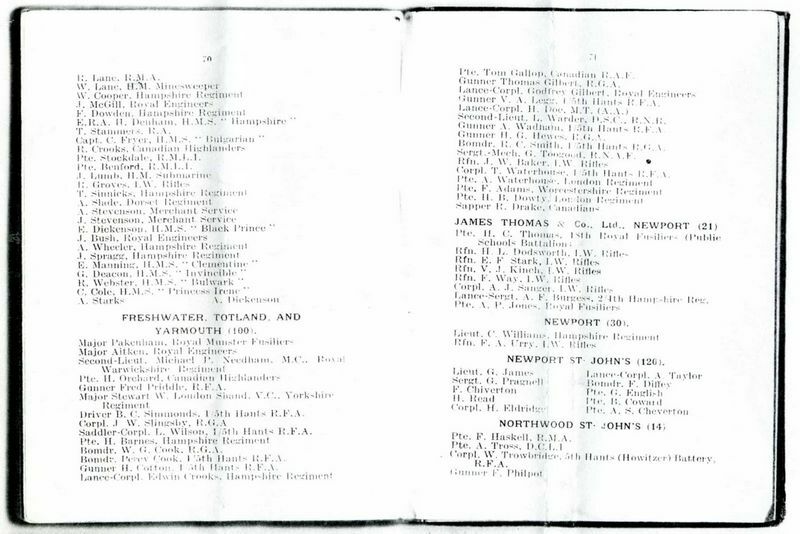 Among those who are well-known on the Steephill ground in the visiting teams who have given their lives for their country are W. Boardman, the centre-half and S. Herbert, the outside right of the Fusiliers, J. Boyce, the captain and right back of the Bembridge Club, and Stokes, of the Worcestershire Regt., while those who will have honourable scars to show are Rogars and Dingle, the backs of the Fusiliers, Hunt and Fifield, forwards of same Regiment, and Phillips, the Sandown centre-half. I will conclude by recording the pleasant announcement of the promotion of the genial Sergt. R. Patey, the sergt.-in-charge of the Worcestershires football team, who always accompanied them on their journeys, to the rank of Lieutenant.